This post was made possible by Global Delight through compensation. The actual contents and opinions are the sole views of the author, who maintains editorial independence, even when a post is sponsored. For more details, please read our disclaimer. You’re the photographer, always glued to your phone snapping shots at social and family gatherings – but you’re never in the picture. Camera Plus ($1.99) offers you a chance to change that, while still being in control of the shot. 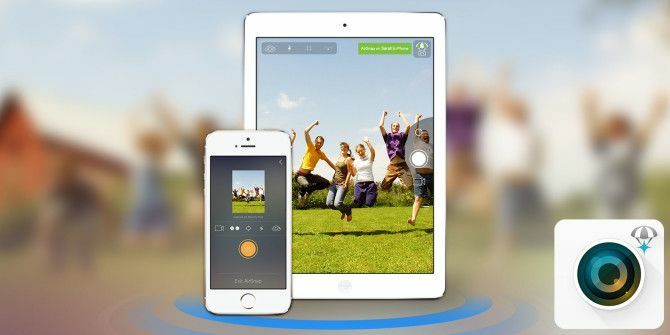 The feature, called AirSnap, uses wireless technology free of fiddly setups and two iOS devices to remotely capture a photo. It’s rather simple in essence, so if you’re sick of being behind the lens and would rather spend more time in front of it, AirSnap just be what you’re looking for. We’re giving away 10 copies of Camera Plus with AirSnap. Read through our review, then submit your entries below. We’ve had a chance to play with Camera Plus before Camera Plus Takes Your iPhoneography A Step Further [Giveaway] Camera Plus Takes Your iPhoneography A Step Further [Giveaway] Despite the many, many photo and filter apps out there, Camera Plus still manages to bring a few fresh features to the table. We're also giving away 10 copies of Camera Plus! Read More (not to be confused with Camera+ Camera+ for iPhone Adds Powerful Controls Without Over-Complicating Things Camera+ for iPhone Adds Powerful Controls Without Over-Complicating Things Freshly updated for iOS 7, Camera+ features a range of powerful features that will please even seasoned photographers used to shooting with digital SLRs. Read More ) and the app offers tangible benefits over Apple’s stock camera app, living up to its promises of offering a unique and useful approach to iPhoneography. The latest addition comes in the form of AirSnap, essentially a wireless trigger for your iPhone that uses Wi-Fi or Bluetooth to communicate. The feature offers photographers the ability set up the frame before joining the rest of the party – or taking a selfie, naturally – from up to 30 metres away from the camera (when using Wi-Fi). This distance is reduced to 10 metres when relying solely on Bluetooth. The feature is activated by first tapping the AirSnap logo (which looks like a camera attached to a parachute) on the device you wish to use as the camera (or slave). From here you should launch Camera Plus on your second device, which is to be used as the trigger. A notice will appear on your slave device once it detects the presence of another device running Camera Plus – select and confirm on both devices and you’ve got yourself a remote controlled camera. From here you can arrange the slave camera however you see fit, and for best results you should probably invest in a tripod (you can make your own tripod mount 3 Cheap & Easy DIY Smartphone Tripod Mounts Made & Tested 3 Cheap & Easy DIY Smartphone Tripod Mounts Made & Tested Unless you are an avid photographer, you'll hardly miss the added features of a proper camera. Too bad your tripod isn't compatible with your smartphone. Or is it? Maybe one day smartphones will come with... Read More ). You can then set up your shot beforehand before triggering it remotely as you would with a standard camera. Camera Plus just added a live preview to the remote trigger, allowing you to see the full shot before you take it. This is a valuable addition to the AirSnap feature, and thought the live performance is not exactly silky smooth, it does allow you to frame your shot and ensure you’ve not cut anyone’s head off. 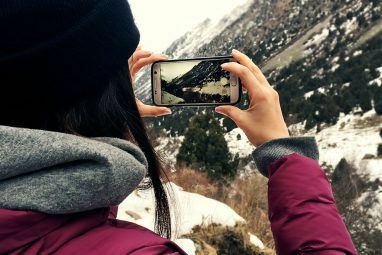 Once the shot has been taken, Camera Plus automatically displays the image you just took on your control device (which can take a short while at times), though the resulting picture isn’t copied for editing or sharing – you’ll still need to return to your device for that. While you’re remotely controlling your slave device, you have a number of options available, just below the live preview. Bandwidth limitations probably make all the difference here, but it’s great to be able to look at exactly what you’re doing, particularly when you’ve got a handful of controls available to you as well. These include switching between video and photo mode, enabling or disabling the flash, switching between the rear and forward-facing camera and toggling the ability to use the volume buttons on your trigger device to take the photo – handy for keeping your phone out of shot. You can also refocus your shot from the remote trigger, but only to the center of the frame. As you can see from the shot below, the live preview window (left) is grainy, but it’s enough to ensure everyone is in frame before you take the shot. Performance is a mixed bag – triggering a shot can take as long as 3-5 seconds over Wi-Fi connections, but be virtually instantaneous when using Bluetooth. You’re probably more likely to be using Bluetooth when out and about, so this probably won’t pose much problem in real-world use. By turning off Wi-Fi on your slave device, you can quickly force the app to use a Bluetooth connection if latency proves to be a problem. The use cases for such a feature are limitless – pack a tripod or find a stable surface and have some fun, wherever you are. AirSnap takes selfies to the next level, allows you to pose with pets or young children without struggling to make sure you’re holding the lens at the right angle and restores the photographer’s ability to participate in group shots. It’s far more practical than setting a timer, as per the SLRs of the 35mm period, or asking a stranger to take a poorly composed shot while on holiday. The biggest limitation is the reliance on two iOS devices, which isn’t much of a barrier if you have an iPhone and an iPad (the app is universal). If you’re a couple or in a group of friends with more than one iPhone, each member will still need to spend the $1.99 on Camera Plus. Despite there being some room for improvement, AirSnap provides a compelling reason to take notice of what the Camera Plus team are doing. The latest update takes advantage of the 64-bit architecture found in newer Apple chips, which makes this latest version of Camera Plus the fastest yet for users of the A7 chip. This means users with an iPhone 5S, iPad Air or iPad Mini Retina can take advantage of faster switching between modes as well as speed increases when capturing and saving too. Developers have also upped the limit on HD videos via email to 5 minutes. For the most part, AirSnap works without too many hitches for such emerging and exciting technology. The live view interface can take a little getting used to but it has its uses as a rough guide for setting up your shot. 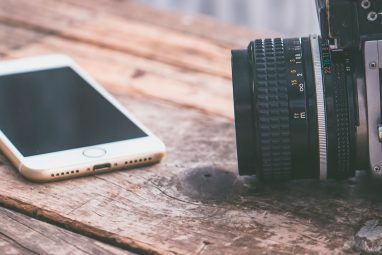 You’ll need to put your faith in a sturdy surface, invest in a tripod mount or dedicated smartphone tripod – but this is generally true of any photographer who wants the ability to remotely trigger their camera and have the results look half-decent. The only other thing to consider when using AirSnap is that you’re likely to be holding another device, possibly looking at the screen – maybe even using your iPad as the remote trigger; and if you’re not careful that’s going to be present in your photo. It’s worth thinking about if you don’t want photo albums full of “me and my iPad” shots. How do I win a copy of Camera Plus with AirSnap? This giveaway begins now and ends Wednesday, June 11. The winner will be selected at random and informed via email. View the list of winners here. Explore more about: iPhoneography, MakeUseOf Giveaway, Smartphone Photography. Love it for taking family or group pictures with myself included. Probably most useful for selfies. This is perfect for "selfie" pic scenario. This would be useful when we're trying to take pictures of my whole family at a gathering. Can see this being really useful to compose "selfie" pix at a good distance though I pay have to pick up an ipod or something. For mountain biking if you were with a buddy and had 2 iPhones: a "trail cam" and a remote attached to the bike with a mount (probably already there using an app like Strava). You could get some cool pics! At the marriage of my cousin. Family album, I would immortalize every moment of my son's life .